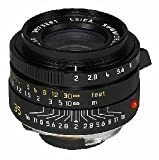 The recent released of Leica 50mm f2 Summicron-M lens is optically unrevised that produced in Wetzlar in German from the late 1960s version. Even though it features more multicoating as compared to its predecessor (I have a Wetzlar-made Leica Summicron that delivers fantastic pictures), however it still not able to compete with the Contax Zeiss 45mm and 50mm Planar lenses when it comes to both optical performance and quality. Within the group of high-speed standard lenses, this Leica 50mm f2 Summicron-M lens is an invaluable universal lens that features a world-wide track record for the very best optical functionality. By means of excellent imaging quality even with the closest range of focusing. The lens is available in both silver chrome finish and black anodized finish. The lens also come with a built-in sliding lens hood. Leica M Series Lenses are lightweight, compact and also including an optimum choice of practical applications, Leica M lenses present you with a distinctive optical performance which has secured them a top position across the world. With speeds of up to f/1.0 and focal lengths ranging from 21 to 135mm, these beneficial precision lenses are notable for their outstanding imaging performance and lengthy service life. With the launched of the Leica 35mm f/2 Summicron-M Aspherical Lens, it been create a little turmoil among the Leica lens lovers. 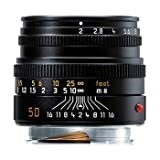 This lens happens to be produced with an aspheric lens surface technology for this long well-known Leica 35mm M lens. The Leica 35mm f/2 Summicron-M Aspherical Lens also features with superb sharpness as well as contrast rendition along with high resolving power, all these constituted a high quality Leica lens and are definitely the advantages of this new computation. This valuable lens offers excellent imaging performance over the whole range of focusing. Its flexibility and all-around functionality helps make this Leica lens a world class lens within the high-speed wide-angle group. Furnished with the 35mm f/2 Summicron-M Aspherical lens, the Leica M gets to be an exquisite compact camera. This Leica 35mm f/2 Summicron-M Aspherical Lens is as well available in a silver chrome plated version. This Leica lens appears to have been modernized with the “6-bit” coding, that enables the digital M camera to read this level of detail optically and also to determine which camera lens is going to be used. The camera could then (optionally) put on a “final stage” software based vignetting correction (if you are using for shooting RAW images, then no chage is made as the lens used is simply recorded).